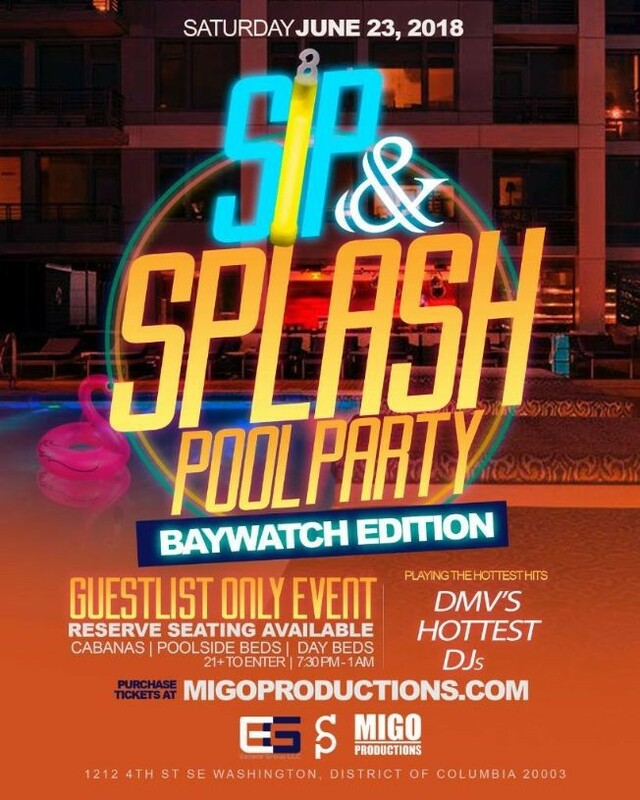 Sip & Splash Baywatch Edition! We are back! Ladies & Gentlemen we invite you to our most Anticipated Annual Pool Party! We have an exclusive event for you, with entertainment like no other! Join Us June 23 for our "Sip & Splash Pool Party Baywatch Edition!" This is a Guestlist ONLY event! Must Purchase Ticket to get on Guestlist! Only ticket holders and RSVP will be admitted access to event. DJ Heavy D & DJ Skeem will be jamming the latest Latin, International, Top 40 mix. Parking: Street parking and parking lot across the street from venue. No Refunds will be provided. If inclement weathers occurs your ticket will be forwarded to the next event date. Venue/Management reserves the right to refuse admission or to eject a ticket holder for behavior likely to cause damage, injury, nuisance or annoyance or for failure to comply with reasonable requests.